... 12 songs from Mike, Chuck, Everett and Locky. Track number 13 is a faithful cover of a Sky Martin hit, "The Snatcher". 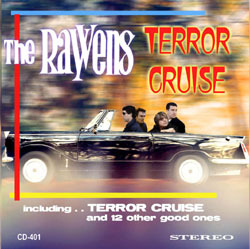 To see the Terror Cruise CD movie... - just click on the CD cover... the file comes down and then choose your Quicktime Player to open it! ... Easy to get! Just click on .. "order"